Censorship as a literary subject has sometimes been necessary in times of change, as it may show how the flaws in power relations influence, sometimes very dramatically, the access to and the production of knowledge. 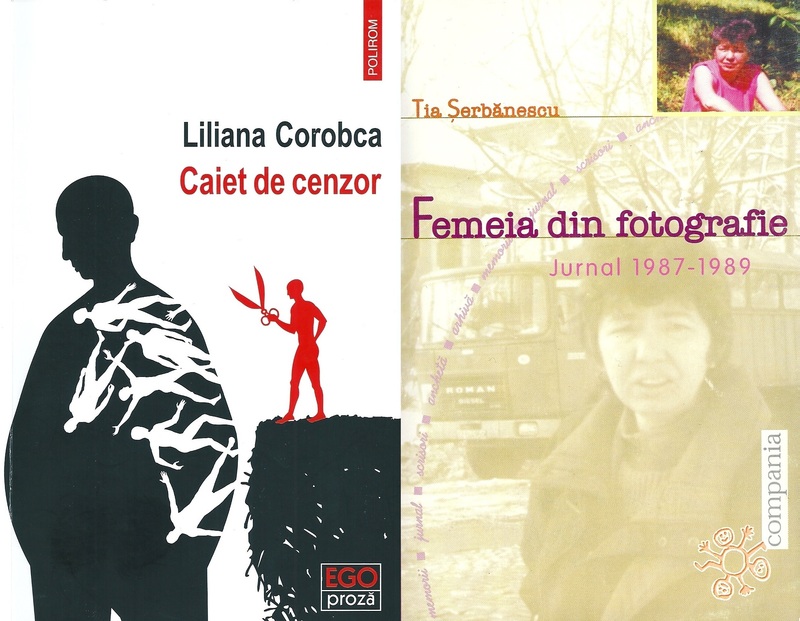 The Woman in the Photo: a Diary, 1987-1989 by Tia Șerbănescu and A Censor’s Notebook by Liliana Corobca are two books that deal with the issue of censorship in the 1980s (the former) and the 1970s (the latter). Both writers tackle the problem from inside the ruling system, aiming at authenticity in different ways. On the one hand, instead of writing a novel, Tia Șerbănescu kept a diary in which she contemplated the oppression and the corruption of the time and their consequences on the freedom of thought, of expression and of speech. She thoroughly described what she felt and thought about her relatives, friends and other people she met, about books and their authors, in a time when keeping a diary was hard and often perilous. On the other hand, using the technique of the mise en abyme, Liliana Corobca begins from a fictitious exchange of emails to eventually enter and explore the mind of a censor and reveal what she thought and felt about the system, her co-workers, her boss, the books she proofread, their authors and her own identity. Detailed examinations and performances of the relationship between writing and censorship, the two novels provide engaging, often tragi-comical, insights into the psychological process of producing literary texts. The intention of this article is to compare and contrast the two author’s perspectives on the act of writing and some of its functions from four points of view: literary, cultural, social and political. Monica Manolachi is a lecturer at the University of Bucharest, where she teaches English in the Department of Modern Languages. Her research interests are Anglophone literature, postcolonial studies and contemporary literature in translation. Performative Identities in Contemporary Caribbean British Poetry (2017) is part of her work as a researcher and literary critic. Her most recent poetry collection is Joining the Dots / Uniți punctele (2016). She has translated numerous books of prose and poetry into or from Romanian. Corobca, L. (2017) Caiet de censor / A censor’s notebook. Iași: Polirom. Cristea-Enache, D. (2002, June 4) “Femeia din fotografie.” / “The Woman in the Photo.” Adevărul literar și artistic / The Literary and Artistic Truth, Vol. 11(619), pp. 5. Luță, V. (2002, May 6) “Despre viață și scris.” / “On life and writing.” Observator cultural / The Cultural Observer, Vol. 114(30), pp. 18. Marcu, L. (2002, May 1-7) “Un jurnal ca un spectacol literar.” “A diary like a literary show.” România literară / The Literary Romania, Vol. 35(17), pp. 6-7. Petraș, I. (2002, September) “Viața ca o corectură.” / “Life as proofreading.” Apostrof / Apostrophe, Vol. 13(9), pp. 6-7. Purice, O. (2017, May 4) “Jurnal de cenzor.” / “A censor’s diary.” Cultura / The Culture, 3rd series, No. 17, pp. 20. Rad, I. (2005) “Aspecte ale cenzurii literare.” “Aspects of the literary censorship.” Cenzura în spațiul cultural românesc / Censorship and the Romanian culture, Marian Petcu (ed.). București: Comunicare.ro. Șerbănescu, T. (2002) Femeia din fotografie: jurnal 1987-1989. / The woman in the photo: a diary 1987-1989. București: Compania. Romilă, A. G. (2017, April 7) “Cenzorul și conștiința de sine a literaturii.” / “The censor and the self-consciousness of literature.” România literară / The Literary Romania, Vol. 49(15), pp. 7. Urian, T. (2017, May 23) “Viață de cenzor în comunism.” / “A censor’s life during communism.” Viața românească / The Romanian Life, Vol. 5, pp. 95-98.
a. Authors retain copyright and grant the journal right of first publication with the work simultaneously licensed under a Creative Commons Attribution License that allows others to share the work with an acknowledgement of the work's authorship and initial publication in this journal. b. Authors are able to enter into separate, additional contractual arrangements for the non-exclusive distribution of the journal's published version of the work (e.g., post it to an institutional repository or publish it in a book), with an acknowledgement of its initial publication in this journal. c. Authors are permitted and encouraged to post their work online (e.g., in institutional repositories or on their website) prior to and during the submission process, as it can lead to productive exchanges, as well as earlier and greater citation of published work (See The Effect of Open Access).